Visit your legislator in his or her district office and discuss these issues. Invite your legislator to the library, especially during a program or time when the library will be busy and full of life, ask the legislator to say a few words, and follow up with photos on your website and in the local media. Join with a neighboring library to visit or host elected officials to call attention to issues that affect your community. Being familiar with the issues will make you more comfortable in talking with legislators, and will also make them more responsive to your needs. Need More Help than a Palm Card? Advocacy simply means to actively support a cause. Libraries are our cause. Many people in the community recognize libraries are an important asset; but there are people who think that technology has made library services obsolete and the current economic situation sometimes makes their argument compelling. Library supporters must remind their neighbors, community leaders, and elected officials of the fact that libraries provide great learning opportunities, excellent public service, and serve as invaluable contributors in their communities. Please click here for the Top Ten Advocacy Tips. Please click here for the Advocacy Toolkit. The Illinois Department of Commerce & Economic Opportunity’s Illinois Energy Now program is fully funded through May 2017. Indian Trails Public Library District recently took advantage of this program for its lighting retrofit project, and received over $39,000 in rebates. Libraries across Illinois can realize the same benefits of reducing operating costs, saving taxpayer money, and protecting the environment. All projects must be completed by May 31, 2017 to be eligible. The 360 Energy Group can provide free energy assessments and estimates, as well as assist with rebate applications. Please feel free to contact K.C. Doyle, Cook County Energy & Sustainability Manager, kathryn.doyle@cookcountyil.gov. Would you like to get more involved with your library colleagues in Illinois? Do you want to meet fun and interesting people while improving academic librarianship? The Illinois Association of College and Research Libraries (IACRL) wants you! IACRL is accepting nominations for Secretary and Vice-President/President-Elect for 2017/2018, with the term starting in October 2017. If you would like more information, please see our bylaws at https://www.ila.org/forums/illinois-association-of-college-research/iacrl-bylaws or contact Past President Gwen Gregory at ggregory@uic.edu. Please send nominations to Gwen by February 17, 2017. Nominations should include a brief bio and a photo. The ILA Youth Services Forum's 4th Annual Tournament of Books is underway! 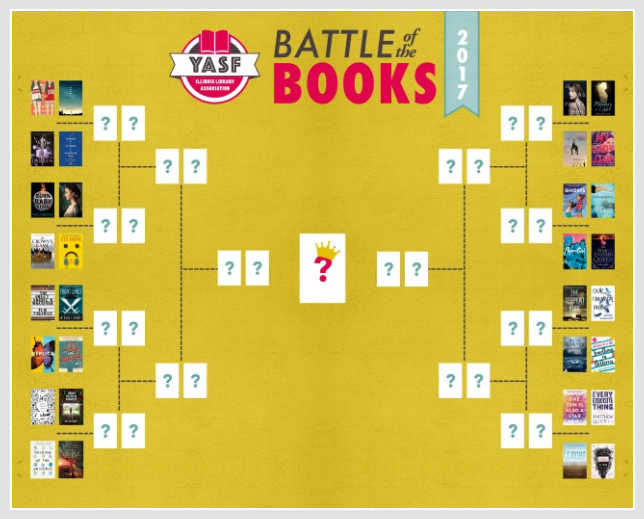 Check out the 32 books in the tournament and make your predictions. The winner of the final round and the tournament will be decided by your votes, so be sure to follow along at yasfnews.wordpress.com.